GOGLA is the global association for the off-grid solar energy industry. Established in 2012, GOGLA now represents over 135 members as a neutral, independent, not-for-profit industry association. Its mission is to help its members build sustainable markets, delivering quality, affordable products and services to as many households, businesses and communities as possible across the developing world. The products and solutions that GOGLA members sell transform lives. They improve health and education, create jobs and income opportunities and help consumers save money. 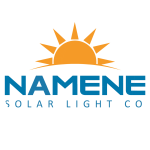 Since 2018 Namene Solar LIght Company is an industry member of GOGLA.